Our mission is to help Pets live the longest, healthiest, happiest life possible with one forever family at a reasonable and sustainable cost. The earlier the vet care, the better for Pets. In fact, Hannah Pets visit our veterinarians over twice as often as under the traditional vet model - and we like it that way! 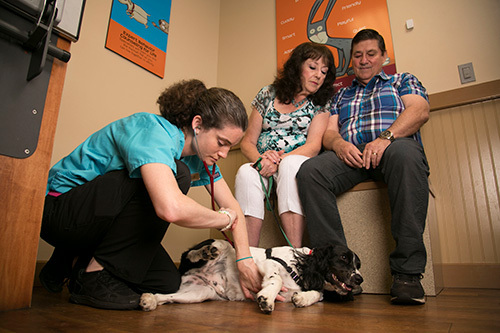 Hannah is a whole different approach to veterinary care - one focused on preventive care that includes unlimited exams and an always-open door to visit the Hannah Pet medical team. Treat all Pet-Parents and their Pets like family. Recommend what's BEST for every Pet and family every time. Provide care efficiently and lovingly. Always deliver this promise to the best of my ability without regard to cost. Unlimited examinations can lead to early diagnosis and more effective treatment for conditions like cancer, renal disease, osteoarthritis and periodontal disease. We also recommend Hannah’s proprietary Total Lifetime Nutrition dog food to help keep your Pet healthy. Routine vaccinations can greatly reduce the risk of many preventable diseases, but should only be prescribed when necessary. Many Pets do not need these chemicals in their bodies, and they should only be prescribed when necessary. Parasite preventatives can greatly reduce the risk of many preventable diseases, but should only be prescribed when necessary. Many Pets do not need these chemicals in their bodies, and they should only be prescribed when necessary. Hannah makes it possible for Pets to experience the true value of preventive care because Hannah Pet Parents never have to hesitate to bring their Pet to the veterinarian due to concerns about price. In fact, our Members have over twice as many veterinary visits per year than under the traditional pet care model. Like our Members, we’re only concerned with what’s best for the Pet. Hannah offers unlimited behavior and training classes at our Hannah locations. You’ll find the Hannah veterinary and medical team to be passionate, smart and caring. You’ll also catch them enjoying their work on a daily basis because they love Pets and all have a Hannah Pet that they love themselves. This is veterinary medicine “unleashed” from uncomfortable decisions and conversations about money. Dr. Tripp at the Hannah Pet Society has been a great behavioral doctor...The result has been remarkable and our pet's quality of life has changed drastically for the better.